I couldn’t believe my eyes when I found the Rhodia Exa Book notebook in my regular book store. It has – just like most book stores here (pen/paper shops are practically non-existing here) – a very limited range of notebooks and notepads. To promote this new range – they only have these notebooks which are a part of the new Exa Book system – they had them propped away in the storage department – it was out of sheer luck I found them. This is meant as a refill in some kind of organizer folder, but it works very well on its own – I actually prefer a simple, neat notebook to putting it into a bigger folder. Since I’ve not had the opportunity to try other Rhodia paper than the web notebook, I was thrilled to have this spontaneous, unplanned opportunity to test this notebook. The paper quality is 80 g per square meter, but it is a wholly different paper quality than the former web notebook paper. It is smooth and dense – not porous as the old web note book. The lines are not too disturbing (I prefer blank or dotted paper) they are discreet and not too narrow or wide. This might well be the best and most fountain pen friendly paper – web notebook included in this comparison – I have tried so far. I tried it with different nibs – some of them are very broad and wet – and there was no signs of feathering or bleedthrough. Really extraordinary! It is a pity that this paper is not used in the web notebook. It is not only fountain pen friendly with regards to the result – it is a very pleasant tactile feel to touch it as well as write on it. I’ve been rather sceptical about the praise of Rhodia’s notebooks and pads, but the paper in this notebook fully lives up to the praise. I hope Rhodia puts this paper into the webbies and that they decide to add blank, dotted and squared paper to the notebook range. If they decide to do that I’d might stop searching for the perfect notebook. PS Just read at Rhodia Drive that Rhodia will introduce the Rhodia webbie 3.0 with BLANK pages sometime during summer. That is great news. This entry was posted in conway stewart, delta, fountain pens, inks, lamy, montblanc, paper, pens, photo, rhodia, stipula, writing. Bookmark the permalink. Sorry for drudging up an old post, but may I ask where you got that pen case/pouch from? This 80g paper is their standard Rhodia paper. What is and was in their Webbies, is a different paper altogether. Of all the Rhodia/Clairefontaine/Exacompta papers, this 80g is my favorite. I prefer blank or unlined myself…. And the new dotPads are mega cool. Rhodia offers various combinataions between sizes, punched and unpunched, lined (lined and margin, and Seyes), Graph, and plain – in white and yellow pads – offered with an orange or black cover. I imagine some combinations are not available, while others are very common depending on where you are. My local stationers is either having trouble getting the plain unlined, or isn’t selling enough to carry large amounts. It’s available, it just sounded like they weren’t seeing much of it come in. I wound up with a lined pad, and I don’t mind it – the lines aren’t spaced as far apart as I seem to remember (I am likely thinking of a different paper). I don’t mind the graph but find the line markings too thick and distracting for me as I write with XF nibs generally. I find I prefer dots or plain lately. You are one of those people who really are thorough when testing a notebook! I’m impressed. I can’t find anything at all locally like this so I order via the mail. I’m glad you found it by accident! Thanks for showing it. Huh, I haven’t seen this product before – how lucky to stumble upon it! I’m sorry you haven’t yet had a chance to try other Rhodia paper. It’s really popular where I currently live, apparently. (Many stores in in the block sell it.) Glad you found something that’s working well with your pens though! Wow, one of your best yet! If I remember correctly – Rhodia was known primarily for supplying paper for drafting, and then moved into other others. I am glad that they are still producing the same paper under Rhodia, especially since they are now owned by the same group that owns Clairefontaine. My understanding is that the paper is a fair bit different for writing experience. I haven’t been able to find any Clairfontaine locally that is not lined, and the Quo Vadis Habana journal I picked up is a Canadian one – lacking the note that it is Clairefontaine paper (so I’m not sure what it has). 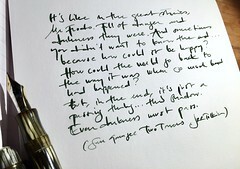 I find ink is sometimes a touch slower to dry on the Rhodia, but I find nibs just glide over that vellum like surface. Thank you for supplying this piece of info! Since Rhodia is a fairly new brand to me I don’t have much experience of them. You’re right about the slower drying time – it is a tad slower due to the “compact” and smooth paper. Its interesting that it is not sufficient to look at paper weight – as it is easy to believe – to get an idea of the quality. There are quite a few porous 100 g papers out there that are not fp friendly. More important is the overall texture and porousness/denseness of the paper. I wonder why they use so many different paper qualities etc in their different pads and why they are so parsimonious about offering anything other than lined paper.